You are here: Home / Blog / Maryland House of Delegates / When Does the Cost of Cleaning the Bay become Impracticable? When Does the Cost of Cleaning the Bay become Impracticable? One of the highest priorities for the O’Malley Administration was to clean up the Chesapeake Bay. As a result of a law suit brought by some citizens and the Chesapeake Bay Foundation against the EPA (Fowler v. EPA), a Consent Order was entered in 2010, by which the Bay states (including Maryland) had to take measures to remediate existing stormwater pollution caused by runoff over impervious surfaces (e.g., roads, rooftops & parking lots). As a result of this each state enacted a Watershed Improvement Plan (WIP) by which it would take measures to filter stormwater runoff over the existing impervious areas. Each jurisdiction is required to reduce the levels of nitrogen, phosphorus and sediment in its stormwater runoff to acceptable levels, which are referred to as the Total Maximum Daily Load (TMDL). 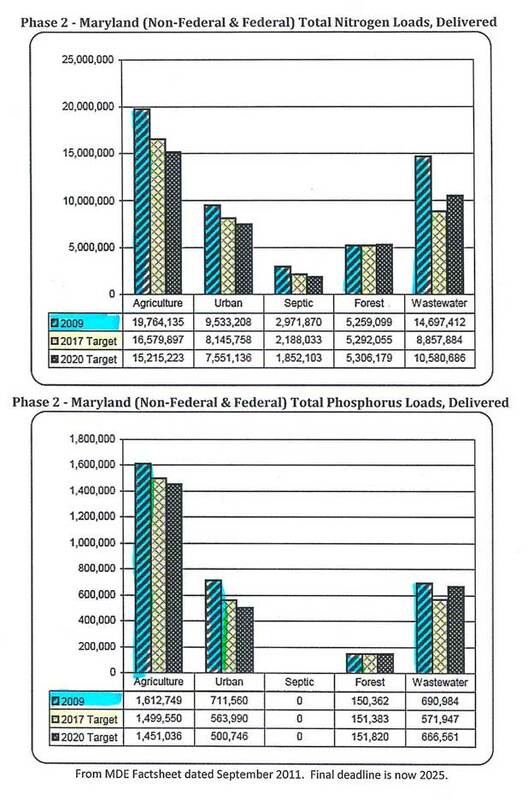 Chart A, below, shows the amounts of nitrogen and phosphorus that the State has determined come from each county. 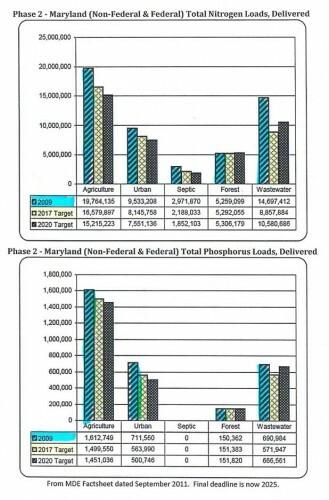 Chart B, below, shows the target set by the State for future delivery reductions of nitrogen and phosphorus. Chart B is a major part of Maryland’s WIP. In addressing what Maryland should do to clean the Chesapeake Bay, Gov. O’Malley has done the bidding of some environmental extremists who have no regard for either cost or cost effectiveness or for uniformity of practices among all states in the Bay watershed. In fact, the extremist policies that Gov. 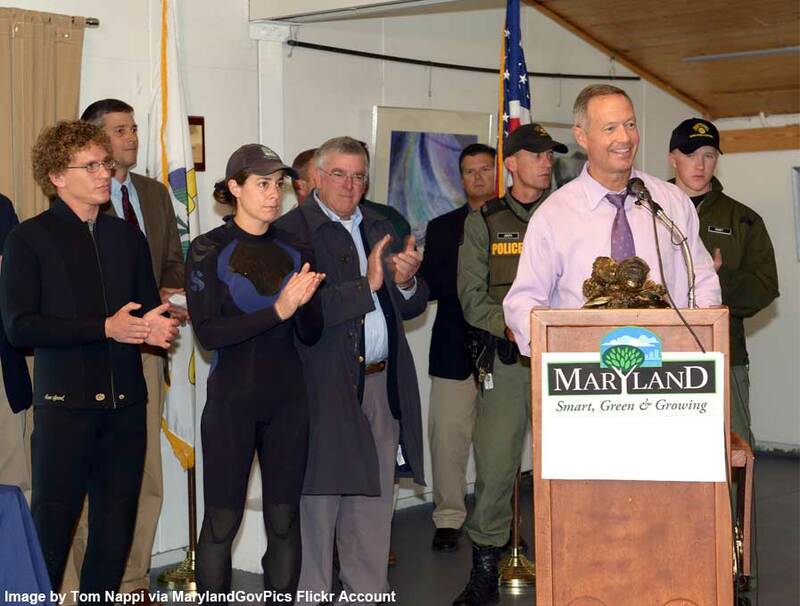 O’Malley has endorsed are exorbitant and punitive on Marylanders and ineffective in cleaning the Bay. If Gov. O’Malley’s policies were minor in cost, they would not pose a significant problem. But they aren’t minor in cost; they are very expensive—even Gov. O’Malley projects their cost to be $14.4 Billion over the next 10 years. Because Gov. O’Malley’s policies are seriously lacking in soundness; they are failing to clean up the Bay; they are punishing Maryland taxpayers; and they are running private businesses out of and away from Maryland. Three current Maryland laws and regulations that are intended to improve the quality of our water and air, are actually seriously flawed and ineffective in improving the environment, and they are harmful economically. These laws are (1) the Stormwater remediation permits issued by the Maryland Department of Environment (MDE), (2) the Nitrogen Offset fees, and (3) the Septic Bill. On about June 28, 2014 MDE submitted its tentative (or proposed) stormwater discharge permit for Frederick County, Maryland. This permit would require Frederick County to do $22.5 Million/year in stormwater remediation work, to address existing areas of development that were not previously filtering stormwater runoff. Frederick County has until September 29, 2014 to file any comments and objections to the tentative permits. All new construction in Maryland must comply with strict regulations to insure that stormwater runoff of the impervious surfaces of such development does not pollute the water. These regulations are strict and often very expensive. But they seem to be effective. They often consist of stormwater management ponds (SWMPs) and other landscaping measures that serve to retain water long enough to promote seepage into the ground, which filter water as it moves through the ground. In fact, these stormwater control measures often improve the quality of the stormwater runoff such that after the new development the stormwater runoff has smaller quantities of nitrogen, phosphorus and sediment than before the development was made. These regulations seem to be successful, although they are expensive. But the remediation of existing impervious surfaces is even more complicated and expensive. How do you fix it? And who should pay for it? The answers to these simple questions are complicated, controversial and problematic. The State addresses this aspect of stormwater remediation through stormwater discharge permits (for each county). Two years ago (2012) the Legislature passed The Watershed Protection and Restoration Act [HB 987]), a law requiring ten jurisdictions (including Frederick County) to enact a tax or fee (the “Rain Tax”) to help pay for the remediation mandates required by the stormwater discharge permits. The distinction between a tax and a fee is important. Fees can be levied on properties to address impacts from the properties, even if owned by the federal government; taxes can be assessed broadly against all residents. The proposed stormwater discharge permit would impose on Frederick County a requirement for us to do remediation work that would cost $22.5 Million/year (or an extra $500 per property tax bill/year). The Rain Tax is a tax (or fee) that the State requires some counties to levy to help fund the requirements of the stormwater discharge permit. There are several problems with the stormwater discharge permits: (1) They have different impacts on each County; (2) They are too expensive; (3) They are not cost-effective in improving water quality; (4) They are scientifically flawed and ineffective; and (5) It is impossible to measure their effectiveness. Unfair Allocation of Responsibility to Remediate Stormwater Pollution. The impact of State’s tentative stormwater discharge permit on Frederick County is twice as much per person as the requirements on Montgomery and Anne Arundel Counties. This is manifestly unfair and wrong. The State has made no effort to make the cost of this remediation uniform and fair. Frederick County has no alternative but to expose this inequity and excess, and to fight it. The cost on Frederick County (proposed $22.5 M/year) would result in property tax increases of over $500/year, which would lower property values vis-à-vis Montgomery County and other counties in the State, would cause businesses to move away and discourage new businesses from moving here. This will in turn result in lost jobs, increased unemployment, increased foreclosures and population reduction—all of which will make the cost of the mandates on remaining county residents even greater. The point is that if the State is going to impose high taxes and fees, they need to do so uniformly—not penalizing one or two particular counties. The discharge permit approach is also scientifically flawed and ineffective. The little improvement that the mandates will have is negligible and gives no expectation that it will help the Bay. Furthermore, without addressing the Conowingo Dam issue and without a concomitant effort from the other states in the Bay watershed, the Maryland discharge permits cannot be successful. Finally, the State has not measured the quality of the stormwater that comes out of Frederick County, and the State does not propose to measure it in the future. Therefore, there is no way to assess whether the measures in Frederick County are effective. Maryland’s approach is based upon broad models, which are in turn based upon assumptions which cannot be proven with respect to any one particular area. 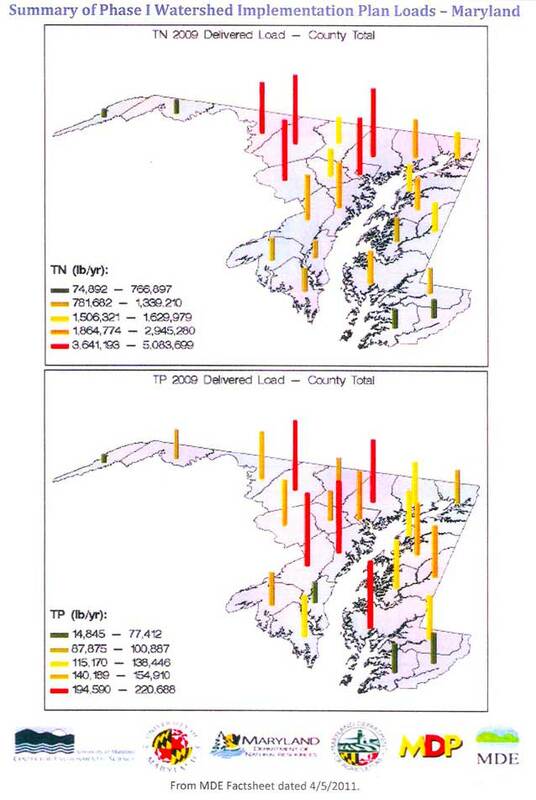 The State of Maryland didn’t have any problem using models until it was recently pointed out that based upon model analysis, the water coming over the Conowingo Dam produces approximately 40% of the pollution in the Chesapeake Bay (46% of nitrogen, 26% of phosphorus, and 33% of the sediment). At that point the State balked at addressing the Conowingo Dam problem until a study could be done to establish exactly what percentages of pollution come from over the Dam. Additional Scientific flaws with Maryland’s Stormwater Discharge Permit Approach. We have previously addressed the obvious flaw—that since less than 20% of the Bay watershed is making improvements to the quality of its stormwater runoff, therefore those measures can never be successful. This flaw is obvious even if the proposed remediation were to be scientifically valid. But it is not scientifically valid. Analysis of the expected effect of the remediation shows that even if all watershed jurisdictions applied these measures that it would only improve a small percentage of the Bay waters. Therefore these remediation efforts would be futile, and they can never succeed. The expensive remediation efforts would be a total waste of money. There are serious flaws in the State’s stormwater discharge permit approach to cleaning the Bay. Because of the high cost of these remediation requirements, every candidate for public office should state his/her position on this issue. One key aspect of this is for candidates to state how much remediation would be acceptable and at what amount the remediation ceases to be “practicable.” For the reasons stated, at the present time I would agree that an annual mandate cost of up to $5 million would be practicable, provided that 40% of this sum went directly to the dredging of the reservoir behind Conowingo Dam, and provided that all jurisdictions in the Bay watershed, including all Maryland counties in the Bay watershed are assessed a similar amount on a per capita basis. Every candidate for State and County office should weigh in on this issue. In 2012 the State Legislature passed SB 236 (The Sustainable Growth and Agricultural Act), which authorized the State to levy a Nitrogen Offset Tax on every development made on property that was not previously developed. This would be a tax that is assessed at the time of construction which would be the equivalent to the cost to eliminate from the air and water the nitrogen that would be added to air and waters by the new development. The proposed State formula would project the amount of nitrogen that would be emitted by the projected inhabitants of the new development. At one point MDE proposed a fee to be determined at the rate of $3,000 per pound of nitrogen that would be produced. However, the projected cost of these offsets was so high, and caused so much protest and complaint, that the State has deferred announcing what the new fee would be. The fee could exceed $10,000 for a new home on a septic system. A Nitrogen Offset would also be calculated for new office buildings and other commercial structures. Frederick County is still awaiting the assessment the State will impose on the recently completed, Catoctin Creek Nature Center, which was feared to be several hundred thousand dollars. The effect of these offsets will be to discourage and prevent residential and other development in rural areas. This law is one of several new laws that are driving small home builders out the State. The offsets do not apply to developments on public water and sewer. The Sustainable Growth and Agricultural Act of 2012 (SB 236, discussed above), also requires that every new septic system installed for residences must have an enhanced nitrogen removal system. This requirement doubles the cost of new septic systems, which increases the cost from approximately $6,000 to $12,000. Because of this requirement, this bill has been referred to as the “septic bill.” This law provides virtually no benefit to state waters or to the Bay. It is an ineffective, futile attempt to improve a minute percentage of water. Its only real effect is to discourage and penalize those who would build new homes on septic systems. The above three tax burdens are in addition to the “Flush Tax,” which was first passed by the Maryland Legislature in 2004, creating a $30/year annual tax on sewer bills. This tax was doubled by the Legislature in 2012 (increasing the tax to $60/year) when it passed the Chesapeake Bay Restoration Act. Funds from this tax were used to upgrade wastewater treatment plants in the state. The Legislature increased the tax in order to raise $1.5 Billion, which is the new projection of what will be needed to complete the sewage treatment plant upgrades. Frederick County is nearing completion of the upgrades on its Ballenger-McKinney Wastewater Treatment Plant. The total cost of these upgrades is approximately $118 Million, of which the State has contributed approximately $31 Million from revenues from the Flush Tax. The balance of the cost ($87 Million) is being paid by Frederick County taxpayers. https://www.cpaulsmith.com/wp-content/uploads/2014/09/OMalley-makes-Chesapeake-Bay-oyster-announcement.jpg 679 897 Admin https://www.cpaulsmith.com/wp-content/uploads/2014/04/c-paul-smith-attorney-at-law.jpg Admin2014-09-10 13:33:402014-09-13 09:41:20When Does the Cost of Cleaning the Bay become Impracticable?